In this solo dining adventure, Gary and friends have their first fully fledged Thomas Keller dining experience at Ad Hoc in Yountville, CA. Note: I’m well aware that, by nature, a meal at a restaurant who only serves a constantly changing menu is something that, in all likelihood, will bear very little resemblance to any future meals there. The meal I’m reviewing, while unlikely to be duplicated exactly, is one I feel will likely be representative of the quality and consistency they strive for. Thomas Keller is considered by most to be the best chef/restaurateur in the country today. Until this past summer, I couldn’t really judge the veracity of that sentiment considering my only exposure to his food were the baked treats at his Bouchon Bakery in the Time Warner Center. JP, at least, had actually dined at Bouchon Bakery a month or so before our trip and both he and his wife Dori were big fans of their meals at this simpler Keller restaurant. So it was without any doubt that on our trip to the Bay Area, JP and I would be hitting up at least one of his restaurants in Napa, bringing along fellow college buddies Aaron and Jeremy, whether they wanted to come along or not! But which one would we go to? There are, after all, three to choose from – The French Laundry, Ad Hoc, and Bouchon (Bouchon Bakery as well but that was a non-starter since that’s doable back home). If we were all somewhat wealthy men, we’d go for the $400 or $500 we’d probably be dropping to dine at The French Laundry but since we’re not and, selfishly, I’m holding out for Per Se since it’s the extravagant Keller option in NYC, we opted instead to do both Ad Hoc and Bouchon on back to back days. 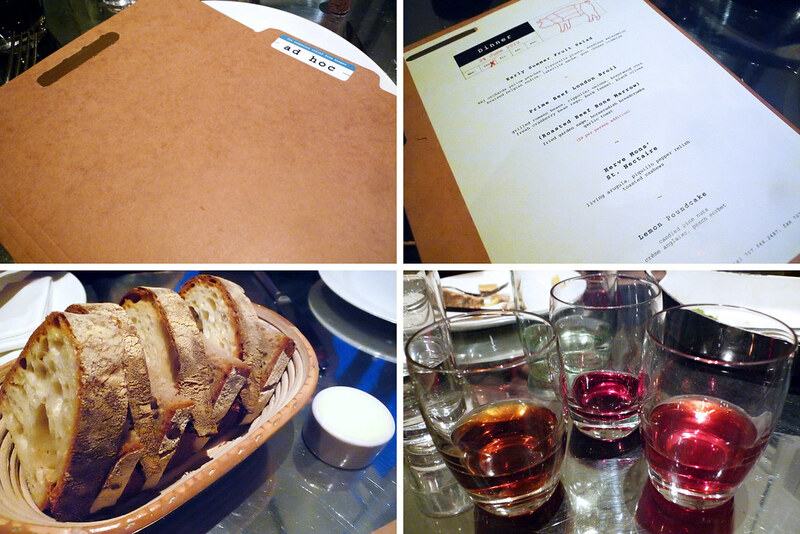 First up on our Keller doubleheader was dinner at Ad Hoc. A late dinner actually since we had a reservation for 9 pm. Actually, it worked out best for us all since it’d be a nice end to our first full day (for some of us, anyway) in the Bay Area. From the exterior and what we saw when we first entered the restaurant, it was decidedly homey and comfortable which is fitting since it’s a decidedly less fancy, less formal Keller affair. Here, it’s essentially American comfort food – excellent, well-executed comfort food, of course – and meals here are served family-style. With its $49 price tag per person for a four-course meal when compared to its much pricier sibling The French Laundry, it’s practically a steal! Our meal started with the Early Summer Fruit Salad which consisted of yellow peaches, pluots, watermelon, braised Belgian endive, mache, and goat cheese. The combination of sweet and sour fruits went really nicely with the minimally dressed mache and endive. The funky tanginess of the goat cheese definitely contributed more to to the sour end of the salad but the creaminess certainly created a rich dimension to the otherwise light salad. 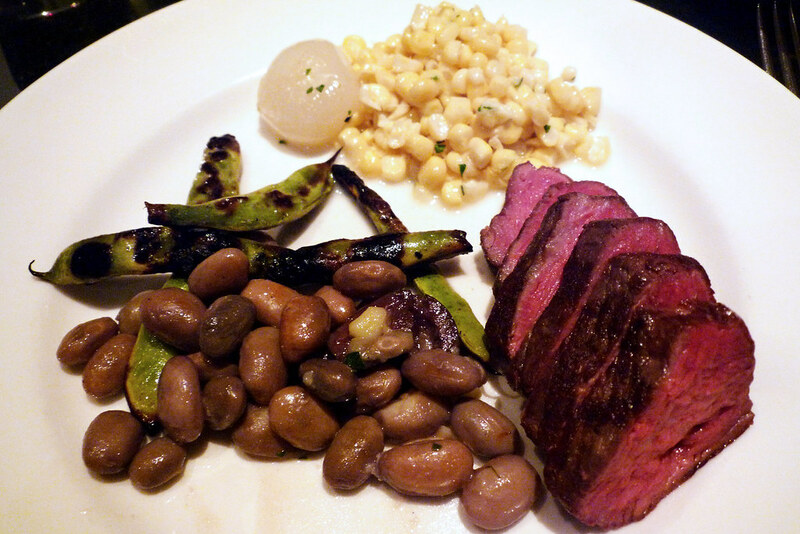 Next up was the main course, a London Broil that had been cooked sous vide, served in a large pan along with some grilled romano beans, fresh cranberry bean ragu, bulb fennel, and black olives. In a separate bowl were fresh corn and cippolini onions. This was some of the best steak I’d ever had in my life, including those I’ve had at steakhouses. Cooked perfectly rare with some nice browning around the edges, these were some mighty tasty slices of beef we had that night. The method of preparation certainly helped here as it kept the ratio of pink meat to browner meat exceptionally high, which is the way this cut of beef should be prepared. 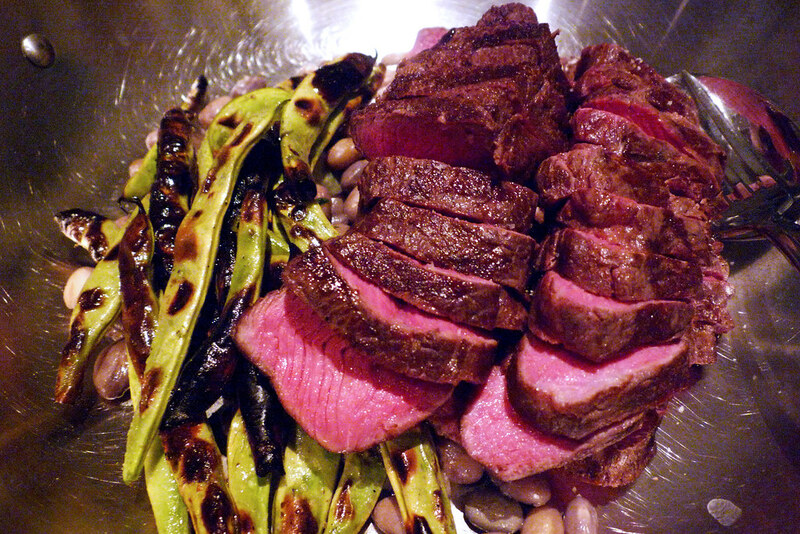 The grilled romano beans were an excellent addition to the pan with its charred exteriors lending the noticeably less charred beef that blackened taste you would expect from a cut that’s normally broiled or grilled. 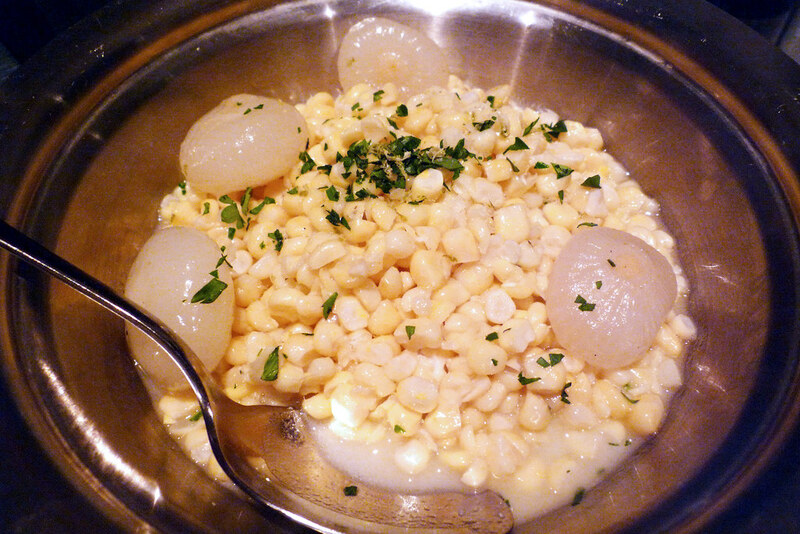 The accompanying bowl of corn and onions were an absolute delight – fresh corn kernels cooked so that they release their natural sweetness and small cippolini onions that were perfectly translucent. Add to that the right amount of seasoning and we were wolfing that corn down just as quickly as the beef. Same goes for the romano beans too. Ah, heck, just about everything in the main course got gobbled up happily by us all. After the beef course came the only real disappointment of the night, the Herve Mon’s St. Nectaire cheese with arugula, piquillo pepper relish, and toasted cashews. I’m not the biggest cheese fan though I’d certainly been working my way to liking cheese but it wasn’t just me that didn’t really like the cheese. One of us had a few bites and was done, leaving the rest of us to finish it. I thought the arugula and relish helped the cheese some but, in the end, the cheese was just the weak link in an otherwise strong meal. 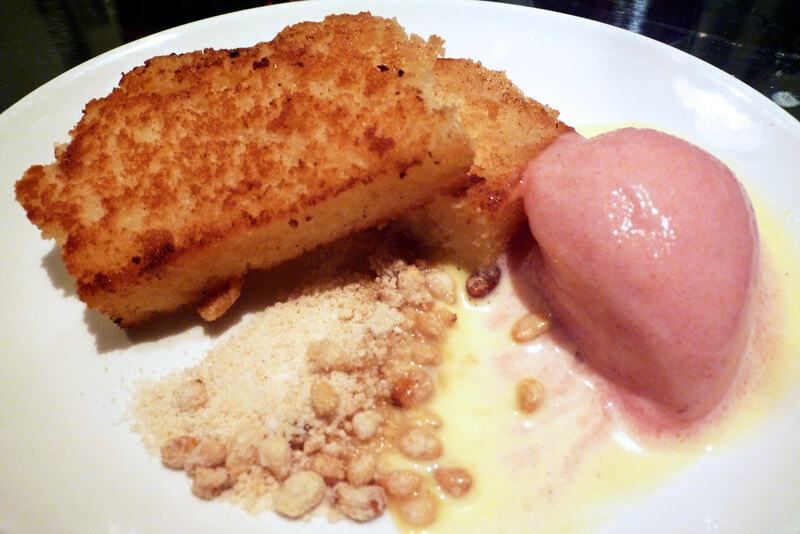 Finally, the dessert, a lemon poundcake with candied pine nuts, crème anglaise, and peach sorbet. What the menu didn’t mention and what I was pleasantly surprised to see when our plates arrived was that the poundcake was grilled. I liked that method of preparation since it kept the melting peach sorbet and crème anglaise from being absorbed too quickly by the poundcake. Of Thomas Keller’s portfolio of restaurants, Ad Hoc is clearly the odd duck in the bunch. There’s the higher end, Michelin three-starred restaurants in Per Se and The French Laundry, the single-starred Bouchon, and the more accessible but markedly simpler Bouchon Bakery. Ad Hoc might not have a single Michelin star to its name but I’d dare say it’s certainly on par with Bouchon, which I’ll expound upon in a separate review. While Bouchon is a very fine restaurant (again, I’ll get to that another time), the liberties and freedom with which the menu is created and later executed makes Ad Hoc, to me, a better dining experience. As I started at the top, I can only attest to how great my meal was and it’s a safe bet this menu won’t be repeated verbatim ever again. They do, however, tend to theme their nights with steak being one of them so I’d look out for that (usually Thursdays it seems) when making a reservation because they sure do steak right here. Ad Hoc. 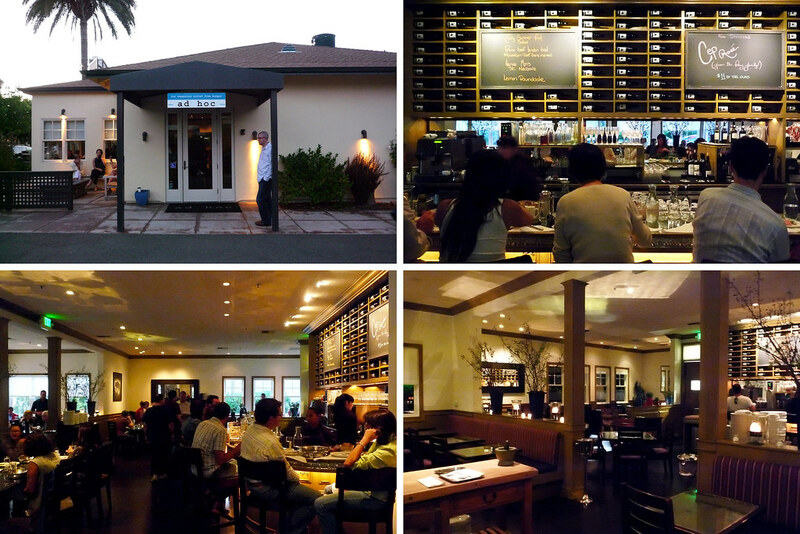 6476 Washington Street, Yountville, CA 94599. [Show/Hide Map] (707) 944-2487.